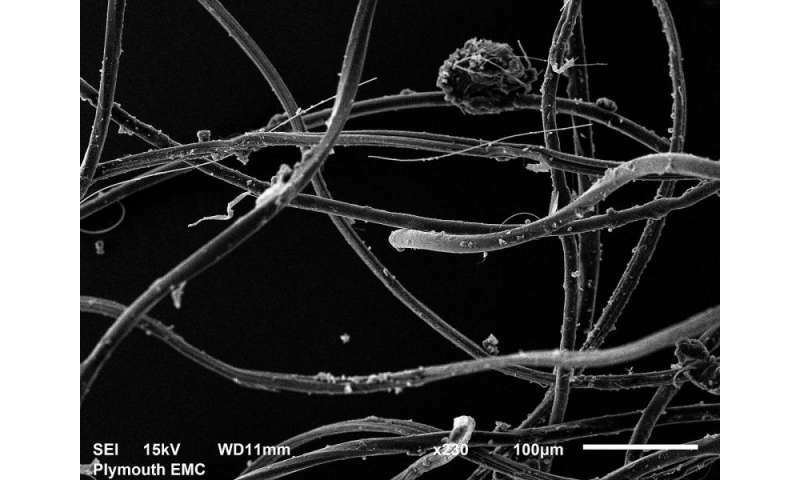 More than 700,000 microscopic fibres could be released into waste water during each use of a domestic washing machine, with many of them likely to pass through sewage treatment and into the environment, according to new research. A study by Plymouth University examined the mass, abundance and size of fibres present in waste effluent following washes of synthetic fabrics at standard temperatures of 30˚C and 40˚C. It found hundreds of thousands of tiny synthetic particles could be released in each wash, confirming earlier work at Plymouth University that the washing of clothes is a major source of microscopic fibres within the aquatic environment. The research, published in Marine Pollution Bulletin, was led by PhD student Imogen Napper in conjunction with Professor Richard Thompson, who is a leading international expert on microplastics and marine debris having worked in the field for more than 20 years. "The quantity of microplastic in the environment is expected to increase over the next few decades, and there are concerns about the potential for it to have harmful effects if ingested. But while the release of tiny fibres as a result of washing textiles has been widely suggested as a potential source, there has been little quantitative research on its relevant importance, or on the factors that might influence such discharges. That was the focus of our research." For the study, a series of polyester, acrylic and polyester-cotton items were washed at 30˚C and 40˚C using various combinations of detergent and fabric conditioner. Fibres were then extracted from the waste effluent and examined using an electron microscope to determine the typical size and any differences in mass and abundance among treatments. The research found that laundering an average washing load of 6kg could release an estimated 137,951 fibres from polyester-cotton blend fabric, 496,030 fibres from polyester and 728,789 from acrylic. The polyester-cotton blend was consistently found to shed fewer fibres than both the other fabric types, regardless of the differing treatments, however the addition of bio-detergents or conditioners tended to release more fibres. "Clearly, what we are not advocating that this research should trigger something similar to the recently announced ban on microbeads. In that case, one of the considerations guiding policy intervention was the lack of clear societal benefit from incorporating microplastic particles into the cosmetics, coupled with concerns about environmental impacts. The societal benefits of textiles are without question and so any voluntary or policy intervention should be directed toward reducing emissions either via changes in textile design or filtration of effluent, or both." Marine litter is a global environmental problem with items of debris now contaminating habitats from the poles to the equator, from the sea surface to the deep sea. This litter has negative consequences for wildlife, for economies and on human health. Over 700 species, including commercially important fish and shellfish are known to encounter marine litter in the environment. The vast majority of the litter found on shorelines, at the sea surface and that affecting is plastic and it has been estimated that up to 12 million tons of plastic litter could be entering the ocean every year. There are solutions, but there is an urgent need for action. In 2004, Professor Thompson's team showed that 'microplastic' particles have accumulated in oceans since the 1960s and are now present worldwide. The International Marine Litter Research Unit described the accumulation of microscopic fragments of plastic debris in the oceans and much of its focus is on these tiny particles which they described as microplastics. Our work has shown that microplastic debris now contaminates shorelines worldwide, that they are present in substantial quantities in remote locations such as the deep and the Arctic. A range of marine organisms including commercially important species can ingest these pieces and laboratory studies have shown there is potential for this to lead to harmful effects. Late last year US president Barack Obama signed a bill outlawing the sale and distribution of toothpaste and exfoliating or cleansing products containing microbeads which are a type of microplastic. Our work on this topic has helped inform government around the world. Recently submitted evidence to the UK Houses of Parliament in relation the Environmental Audit Committee enquiry on microplastics. The full study – Release of Synthetic Microplastic Plastic Fibres From Domestic Washing Machines: Effects of Fabric Type and Washing Conditions by Napper and Thompson – will be published in Marine Pollution Bulletin.